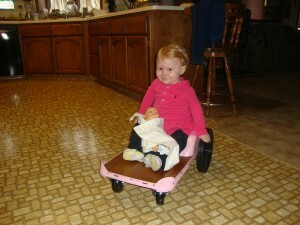 Laelia’s Thanksgiving came with early Christmas presents! 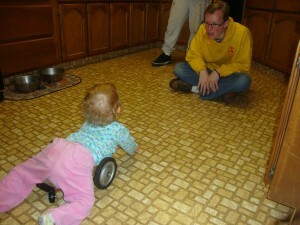 Grandpa (my dad) made her a baby wheelchair (caster cart with wheels) and a crawling helper (carpet square with wheels). Check out the personalized plate! 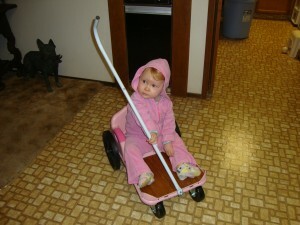 It comes with a pole you can attach and help her along. 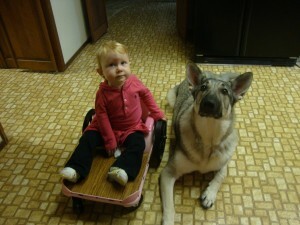 So when the dog would sit at the door begging for a walk, so would Laelia. She doesn’t quite have the hang of this one, but we’re still trying. Here’s some other photos of our Thanksgiving. I didn’t get my camera out much this trip only because I was distracted by all the fun! Laelia spent lots of time with the doggy. They love each other. She’s said nothing but, “Where’s doggy?” since we got home. Laelia got a plastic baby from the GCBC nursery that we forgot to return. I know, stealing from church, straight to hell, right? Sooooooo, maybe mail it back? Maybe once she falls out of love with it? Maybe mail the church $20 and a thank you note? 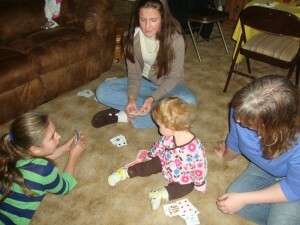 Laelia’s “helping” the girls play cards. 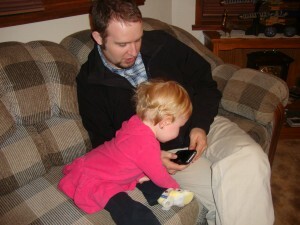 Laelia “helping” Uncle Daniel with his iPhone. This is the year for mobility! 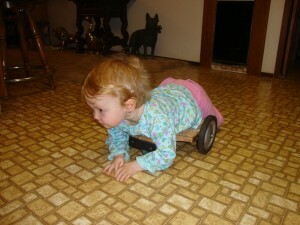 We’re working hard to see Laelia sit up, stand and scoot before she turns three! 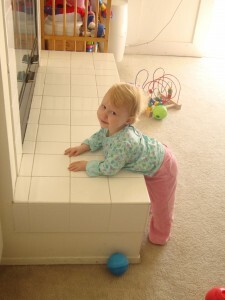 We found out at our last trip to the PT that her body is still not in the position for standing. That’s what the surgery was for so we’re bummed as you can imagine. But she is much straighter! We have some new hip stretches for her (that she hates) and some new weight bearing positions for her (that she hates more), so we’re hoping all this hard work will pay off before next October. If not, then we’ll see if another surgery can’t do the trick. I’m pretty optimistic though. It’s weird, sometimes she can’t do something that I would think she could do, like get out of a kneeling position on the couch, and then other times she does something I didn’t think she could do, like scoot across the living room! 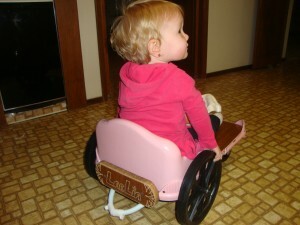 Here’s the video of the scooting! We found out some interesting things this week and I’m not sure what to make of them. Apparently how her hair all seems to come from that whorl in the back and then sweep to the side (she doesn’t have a straight part like me) is due to her arthrogryposis and the position her skull was in while in the womb. Also her labia didn’t fully form since her legs were so wide spread in the womb. It probably won’t affect anything, but who knows. Just random things for Mommy to worry about. Anyway, one thing the surgery really helped was her feet! This is before her bath so there’s still crusties on her feet from the casts. 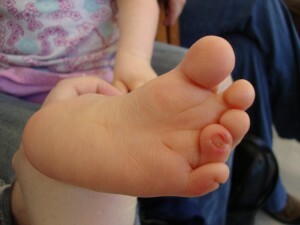 Left foot after minor surgery AND serial casting. Left foot after major surgery! Getting chased by Daddy Monster!!! 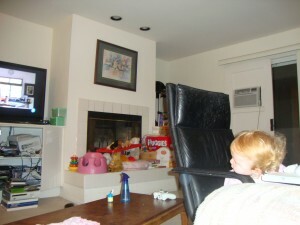 “Laelia can’t watch TV,” Charley says. “But I have her turned around and faced away from it!” I says. “But she can hear it,” he says. “I have it muted with Closed Captions,” I says. “I think she’ll find a way to watch it anyway,” he says. “I don’t think so,” I says. The will of the Laelia shall not be denied! Cognitively she has become more aware of her own wants and desires. Now she wants crackers for dinner every night. She will push plates away in disgust and beg for dessert. She wants to play that Wallace and Gromit game all the time, and lets us know that it’s time for “DOGGY (and) GUY!” Anytime I’m anywhere near the computer I get, “Doggy guy? Doggy guy! Doggy guy!” Her sweet “please” has even become a demand. 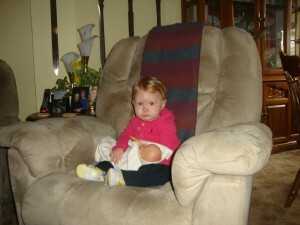 She’s my little willful one! 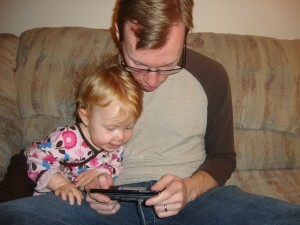 She’s also learned to chant “READ BOOK!” before bed, but only when “NO NIGHT NIGHT!” isn’t working. And that pout! Wow! Many a daddy have fallen under it’s power. Okay maybe I’m naive enough a parent to still think it’s all cute. (Oh it’s so cute.) But telling her “no” has become a constant. I try, “No thank you.” And I’ve even tried saying, “I know you want this, but we have to have this instead,” trying to focus on the positive or distract her with something else. But even when it seems fruitless, as it stands I’m still bigger than her. So ha! But hearing all the “no”s have taught Lali a most useful word. Well, “most useful” until you actually do in fact want something and are incapable of voicing that want because of your amazing new-found word! Laelia can say, “Mama,” now!!! It’s so nice to finally hear! She could say “clavicle” but not “mama”… I mean I was starting to feel gypped. 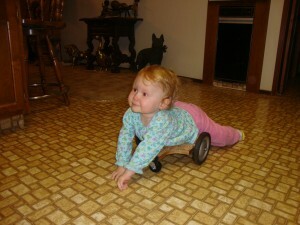 Although we have a friend who’s girlie said, “Tony Hawk” before “Mama” so I don’t feel so bad. Lali had just finished a day at school followed by a short afternoon with Lauren. When I finally got off work and up to the front door I was greeted by two grinning faces, then one of those faces (the Laelia one) says, “Hi MA-MA!” It was so precious! First time I’ve ever heard it! And Laelia said “Mama!” and “Mama please!” and “Mama Mama Mama!” all the way home! But that’s not her only trick as you’ll see in the video.